What is the best EL84 to buy? 6P14P-EB! What is the best EL84 to buy? It depends. In 1965 that was sure Telefunken. Today, with the prices of collector pieces raising 20% per year, burning Telefunken EL84 is an expensive hobby. After 5000 hours they begin to wear out, and they are worth not much any more. A similar situation we have for the Philips EL84, also a fantastic tube, but expensive. A good alternative is the EI EL84, which sometimes can be found. Or, use new production EL84 from China or Russia, but we all know NOS and new production is another quality grade. 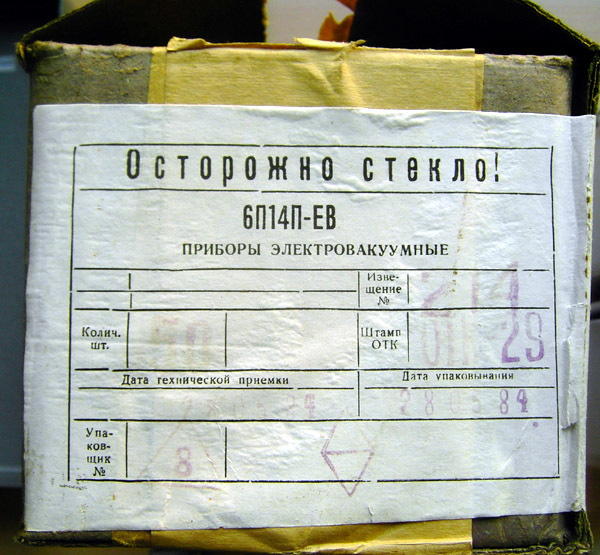 What is still available is Russian NOS EL84, called 6P14P. 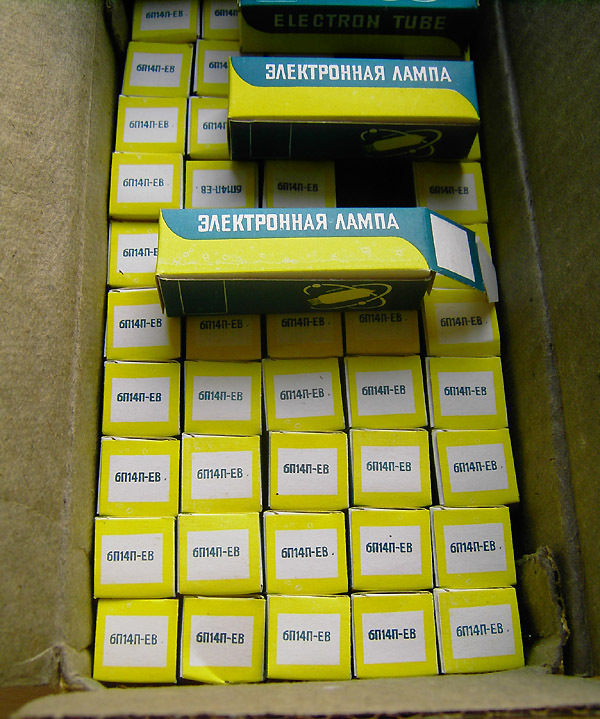 Perhaps not many of the readers had the chance to compare lots 100pcs original packed NOS tubes with each other, or compare such lots with 100pcs of new made tubes. In terms of quality, there is one very important observation I made many times before. If tubes of a lot appear all identical, this promises best quality. Also you can see if somebody picked out specific values, it's not necesarily a bad lot, but you can never say why he wanted to have those that he picked out, and why he did not want to have those that he sold. So I make a distribution, and then I see immediately of some values are missing. Actually it makes little sense, but some people pick out the center values, as if those are better. Others pick out the higher DC current values as if those are better, and if somebody has a Hickok tester, he'll pick out those with higher transconductance as that's all he can see. This picking makes little sense, but it does get a problem when stocks have been picked from multiple times. Then you end up with tubes that have lower parameters for everyting. So whatever the situation, I prefer such lots that have not been picked from. So I take from 100 tubes randomly 6 tubes. When it find them all IDENTICAL it means we have very good chances this lot has longest lifetime, and problem free operation. Also vice versa, this applies. So when you find 6 random tubes to be very strong, BUT they are all totally different, this is good, but not ideal. This lot may have lower lifetime, and problem rate is highter. Generally it can be said, just this is the weakness of Chinese tubes. They throw nothing away. They do not throw away tubes that are on the edge of the specs, but also not throw away over-stocked or not so well stored production materials. Like a box of getters was in contact with air too long, etc. Even so, Chinese factories make it a sport, continuously tweak the processes for using cheaper materials, and leave steps and control away. Main thing, the tubes work, and if it goes wrong we replace them, they say. This will lead unavoidably to a wider spread in tube parameters. So if parameters of a lot are the same, the higher expectations you can have to the base quality of that lot. The 6P14P-EB is a tube from Russian old stock. It was originally designed for the military to have long-life audio tube with low-microphonics, and not having to use the lower quality EL84 radio tube for this. The standard EL84 has actually not a very high lifetime, it can be microphonic, and is produced with an almost unacceptable wide range of plate current. The 6P14P-EB deals with all of these problems at the same time. This tube used to be very expensive when it was made! It was never before available for commercial use. NOS stocks of this tube have been released for public sales only recently, and stocks are low. The most incredible thing of those, is the heater tolerance which is 10%. 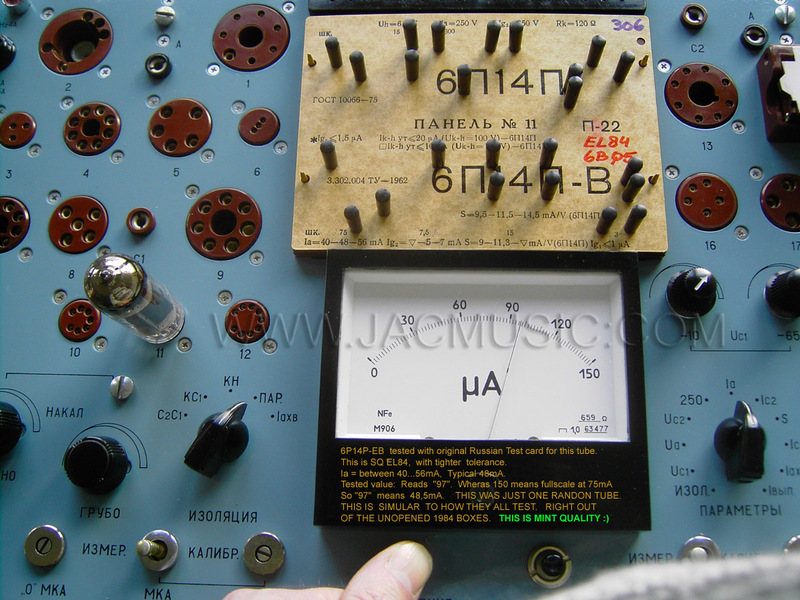 If you know about tubes, you will immediately recognize the is very special. This is only so for tubes like ECC801S, ECC803S, etc, and some (very very ) few of the American noval tubes. All of these 10% tolerance tubes are small signal tubes that do not get very hot. Yet, you find here 10% for a tube like EL84. This is really special. Furthermore, the weight of this tube is 19 grams which is 40% heavier as regular EL84, like for instance the Philips NOS. Matching in pairs or quads in included in the price. 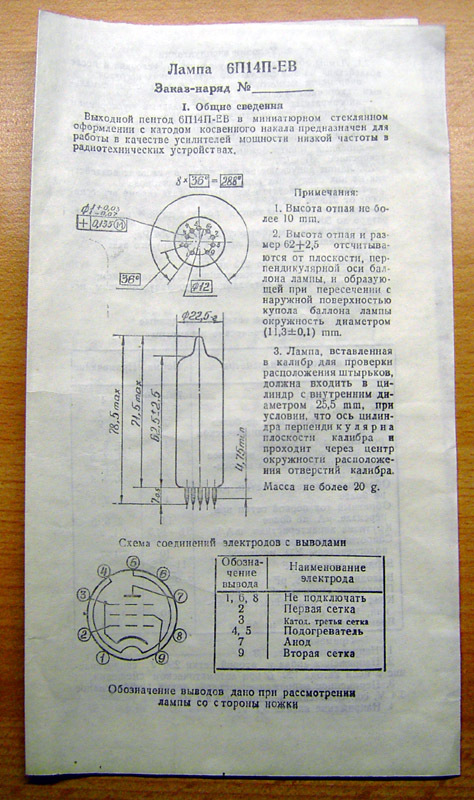 WIth the tubes comes a four page original printed data sheet, listing in full detail the excellent specifications of this tube, in Russian. The table below is an extract from it. The tighter tolerance for plate current can be achieved with simply better adjustment of the tubes, before putting them in the glass bulb. The longer lifetime can be achieved by using more expensive materials. Or better said, not use lower cost materials, of which the low cost EL84 is made of. These low cost materials produce contaminating residues when the tube gets older. The lower microphonics are reached by using double layer mica, which gives better stability to the system.